East Clackamas County has some of the best scenery for road riding in Oregon. 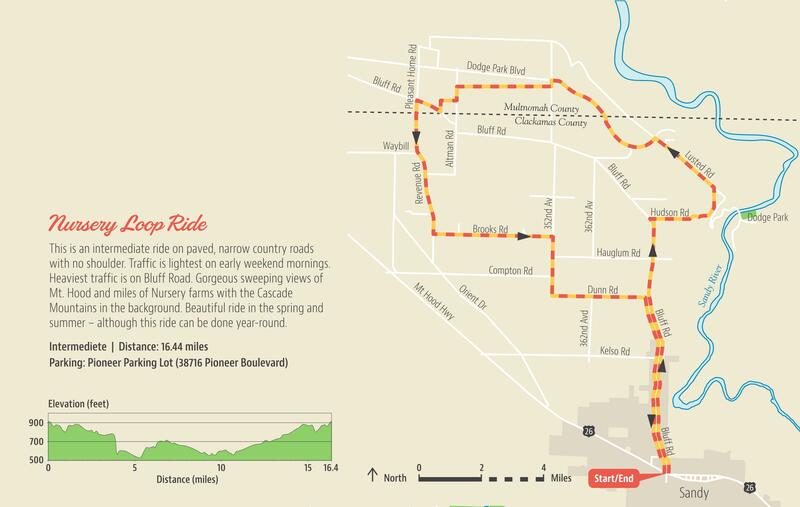 Whether you're looking for a leisurely cruise across town with the family, a scenic ride on a country road to get your heart rate up, or a day-long excursion in the foothills of the Cascades, the Sandy area can fill your road riding needs. Use this page as your road riding resource for Sandy and it's surrounding communities. 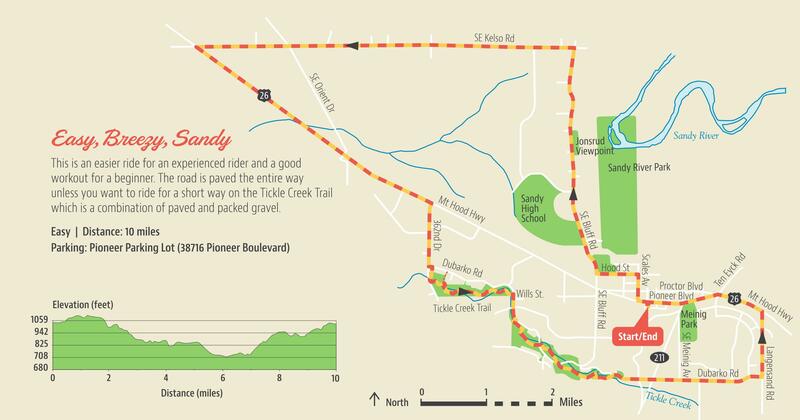 The 2016 City of Sandy Bike Map - This map was developed through a partnership between the City of Sandy and Clackamas County Tourism & Cultural Affairs. Print it out online using the link above, or get a hard copy at any of the Bike Friendly Businesses in Sandy. You can also get a rain and tear resistant copy at Otto's Ski & Mountain Bike Shop (38716 Pioneer Blvd), Sandy Bicycle (17390 Smith Avenue) , the City of Sandy Recreation Department (38348 Pioneer Blvd) and the Sandy Historical Museum & Visitor's Center (39345 Pioneer Blvd - ask counter staff for waterproof version). 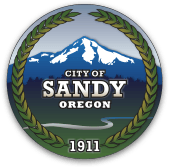 The Sandy Bike Station* - Located behind Sandy City Hall (39250 Pioneer Blvd - right next door to Joe's Donuts) at the Council Chambers entrance to the building, the Sandy Bike Station was completed in June of 2016. Another partnership between the City of Sandy and Clackamas County Tourism & Cultural Affairs, this installation contains a Dero Fixit bicycle station complete with common repair tools and a heavy duty tire pump for making adjustments to your bike on the fly. Clean restrooms, a video-monitored lobby and a refrigerated water fountain with a bottle fill spout are also available during regular business hours right inside the doors of City Hall for your convenience. Additional City facilities in Meinig Park right behind City Hall include water fountains at the first bridge and the gazebo, and restrooms in-between the main stage and the gazebo. These facilities are available 7 days a week from 8:00 am to 9:00 pm from mid-March through the end of October. * - For riders in need of repairs beyond the scope of the Fixit station, both Sandy Bicycle (503-826-1070) and Otto's Ski and Mountain Bike (503-668-5947) have certified bicycle techs on staff and would be happy to assist. Ride Oregon Ride's Find a Ride - This concept for this tool was developed by Travel Oregon from the creative energy flowing from the Oregon Bike Summit several years ago. The site is intended to be an online epicenter and repository for cycling information in Oregon. 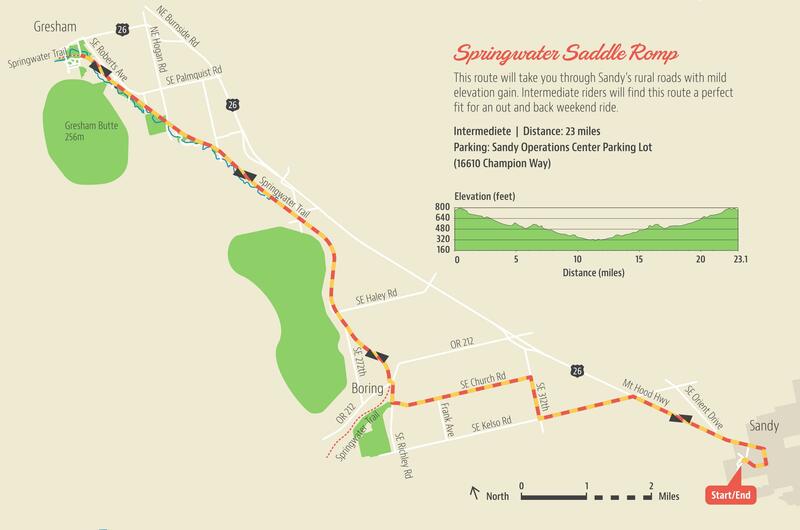 Enter "Sandy, OR" in the location field and de-select all of the ride types except "road rides" to see some of the more popular road routes in the region, including the Historic Oregon Trail Tour, the Lolo Pass Loop and the Sandy River Ride. 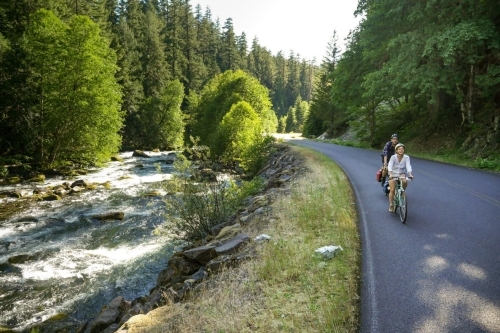 Cascading Rivers Scenic Bikeway - This 70 mile trip starts at the bike plaza in downtown Estacada and follows the wild and scenic Clackamas River to the City of Detroit, Oregon via Hwy 224 and Forest Road 46. 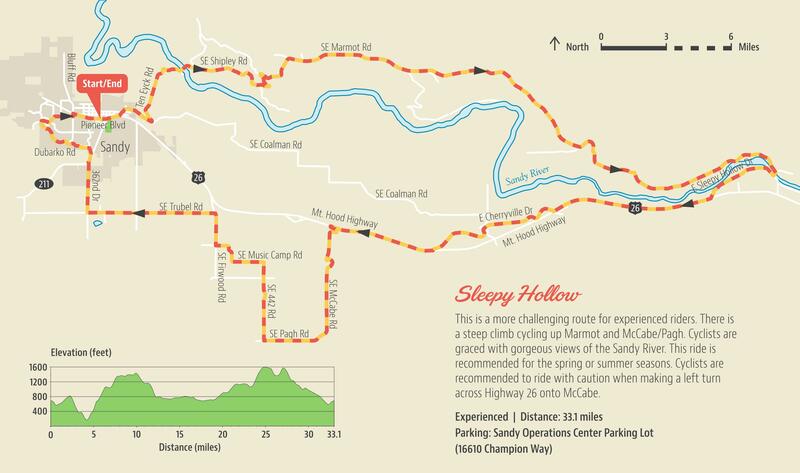 It is not for the faint of heart - the southbound route (Estacada to Detroit) includes a 3,125 foot climb through rugged forest along the Clackamas and Breitenbush Rivers. 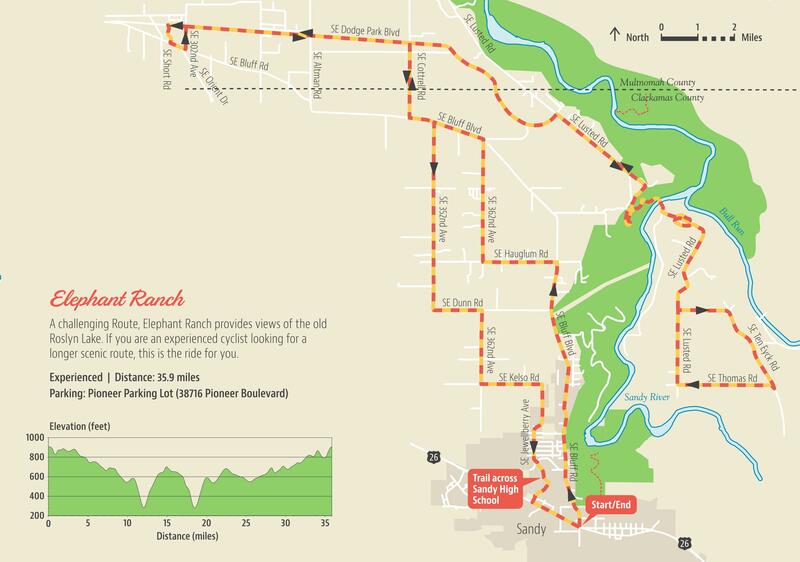 There is plenty of free parking in both Estacada and Detroit, and the Estacada end of the route is also accessible via SAM bus from Sandy - see the Transit Resources for Cyclists page for more information. This route is closed during late fall and winter. Get your official Oregon State Parks map and cue sheets for the Cascading Rivers Scenic Bikeway below.